Christmas Ornaments Made in USA - Clear Crystal Glass Three Inch Ornament Ball - A Christmas Ornament Co. This ornament is an exercise in simplistic beauty. In fact, one really needs to hold one in one's hand to appreciate the quality. This ornament is of heirloom quality and will last for generations to come. Since each ornament is hand-made, no two are the same. This ornament is "free-blown" using no mold - just the skill of the blower's steady hand. Makes a fantastic gift for anyone. 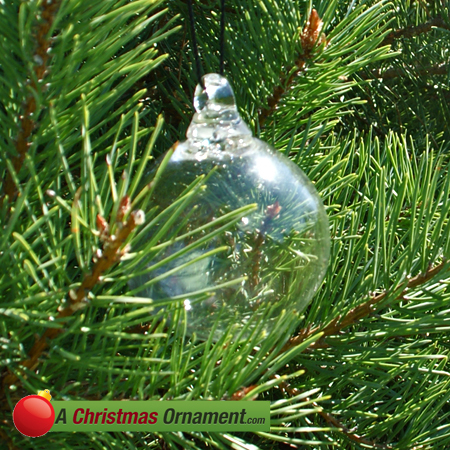 This simple yet elegant ornament can be hung outdoors year 'round and makes a terrific gift. This heavy, clear glass ornament is hand-blown with pride in the U.S.A. Measures 3 inches across.